An Ealan Bhan is a traditional Irish song. The presence of the Swan is very strong in Celtic Tradition, being associated with deities like Brighid who participate in the symbiosis of the healing waters and the sun. They are associated with music, poetry, love, purity and the soul. They are shape-shifters, can take human form, and have mastered the elements of water, earth and air. Among Druids, the Swan represents the soul, and in accordance with its death aspect, is associated with the Festival of Samhain. The swan aids us in traveling to the Otherworld. Swans are also sacred to Bards, and their skin and feathers were used to make the tugen, the ceremonial Bardic Cloak. 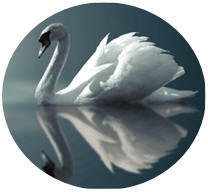 Swans appear throughout Irish folklore. An Otherworldly bird, they are often the disguise of Fairy Women. At certain times of year, a swan maiden can transform herself back into a human, such as at Summer Solstice, Beltane or Samhain, when the veils between the worlds are thin. The White Swans of the Wilderness were children of the Tuatha de Danaan, who settled Ireland, and became the sidhe after the invasion of the Milesians. And that the sun cannot raise. The ocean is too wide to swim.